Elliette Ellis v. Carmenita LSG Express Delivery, et al. Case Summary: Plaintiff, an active woman in her seventies, owned and operated her business, which designed and manufactured special occasion and mother-of-the-bride dresses, for nearly fifty years prior to an automobile accident. At its height, annual sales of the company exceeded $10,000,000. 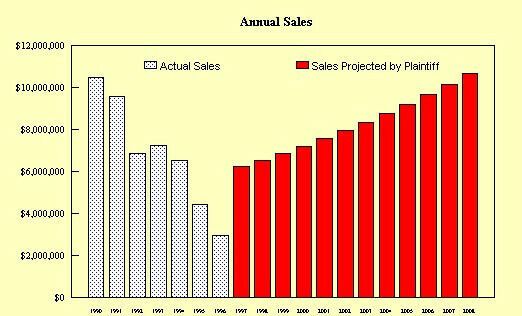 More recently, however, sales had declined. Within a year after the accident, in which plaintiff suffered fractured ribs and sustained other injuries, plaintiff liquidated the business for $250,000. Plaintiff claimed that the injuries she received in the accident forced the liquidation. Testimony Summary: Plaintiff’s damages expert testified at trial that economic damages were between $3,208,853 and $5,050,344. He contended that plaintiff had been in the process of turning the business around at the time of the accident. He valued the business under the assumption that, but for the accident, plaintiff’s business would have achieved sales and earnings similar to results the company obtained before the company’s decline.Mr. Neches was retained to rebut plaintiff’s damages claim. He began by gathering sales and expense data from plaintiff’s business records, from which he determined that plaintiff’s business had been failing for several years prior to the accident. Sales, shipments, gross profits and earnings had all declined. Mr. Neches testified that plaintiff’s assumptions regarding a successful turn around were speculative and unrealistic. He prepared graphs demonstrating the inappropriateness of the assumptions used by plaintiff’s expert to value the business (see example below), and he prepared an alternative analysis using realistic assumptions. Using this alternative analysis, Mr. Neches testified on behalf of defendant that economic damages were, at most, $47,000. Result: The jury rejected the damages claim presented by plaintiff’s expert and awarded the $47,000 in economic damages testified to by Mr. Neches.